If the stresses and responsibilities of daily life have you feeling down, plan a trip to Pyeongchang. Your worries will fly away as you take in the pure air and beautiful scenery. The area offers wonderful outdoor activities year round, but the best time to visit is in winter, when the mountains are blanketed in snow. Visitors have a pick of the many ski resorts, some of the best in the nation, and winter festivals in the area. The city has so much to offer, it was selected as one of the “52 Places to Go in 2016” by American newspaper The New York Times. Keep reading for an in-depth look at all this eco-city has to offer. 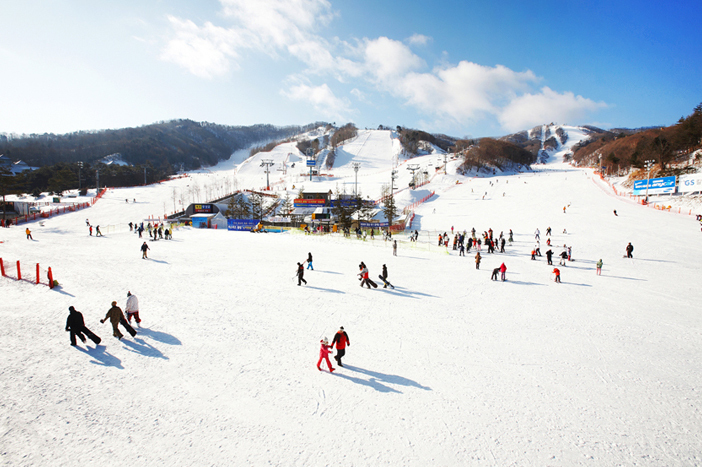 Phoenix Snow Park is one of Pyeongchang's many ski resorts. In addition to being the host venue for snowboard competitions, the resort features many slopes, including some certified by the International Ski Federation. Skiers can freely choose their course down the mountain from the peak. Alpensia Resort is a tourism complex located in the beautiful and pure nature of Daegwallyeong mountain pass. With a name meaning “Fantastic Alps of Asia,” the resort is popular year round. The resort is divided into a winter sports area, golf village and resort area. The resort’s main area features hotels and condominiums, as well as entertainment facilities such as Alpensia Ocean 700, a year-round indoor water park. In addition, the winter sports section consists of a variety of ski slopes and a ski jump tower. 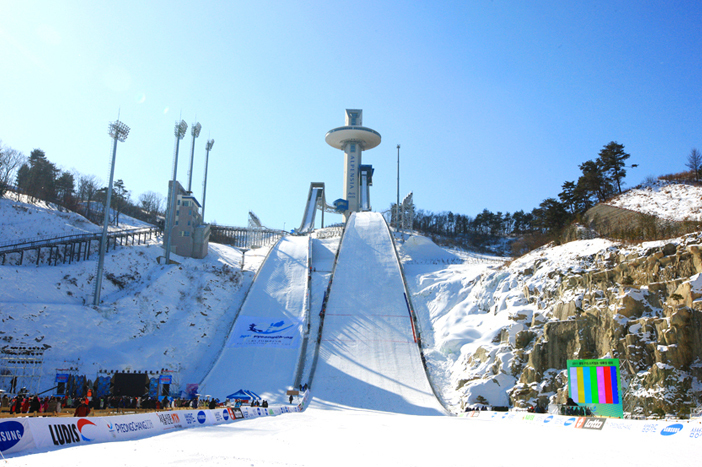 The ski jump tower was used for the ski jumping competition of the Pyeongchang 2018 Olympic Winter Games. The ski jump tower serves as an observatory and is open to the public. Visitors can take a monorail up to this great vantage point to view the beautiful scenery. Visitors can also sign up for a special tour to also indirectly experience the thrill of ski jumping at the athletes’ regular practice zone. * Special tour includes free admission to K98, Haneulgil Ramp experience, Ski History Museum, and Baby Photo Zone. 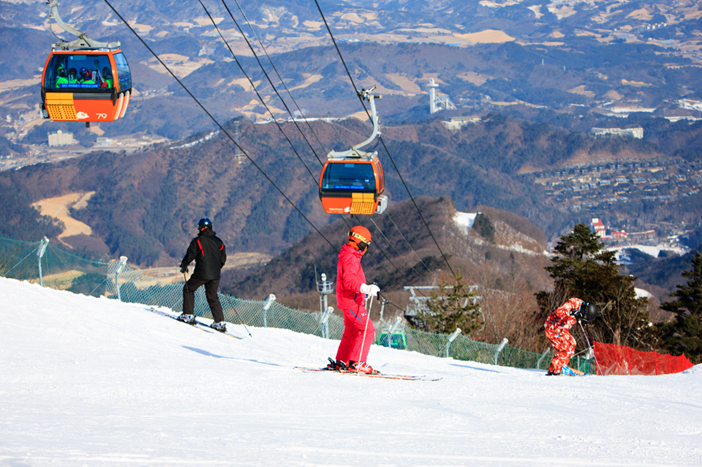 Yongpyong Resort has many different slopes, as well as the longest slope in the nation, drawing in many visitors every year. The fun doesn't stop when the ski season ends; from spring to fall, guests can enjoy golfing and extreme sports such as a zip line and the mountain coaster. The mountains are especially beautiful for hiking in spring and autumn. We recommend taking the gondola to the peak and enjoying the fresh air as you hike down. 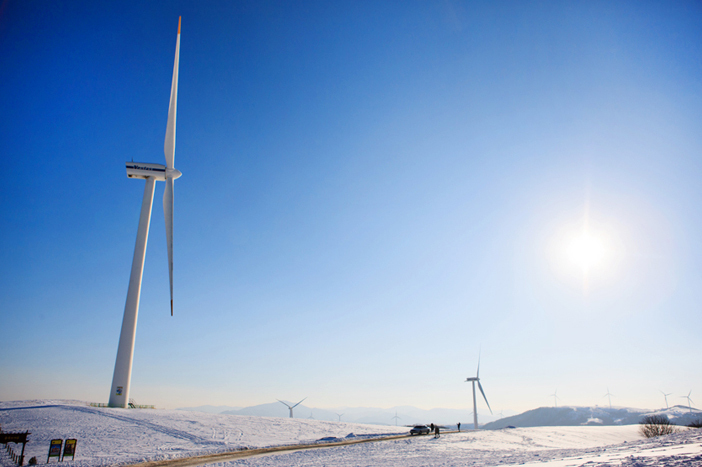 Asia's largest green pasture, Daegwallyeong Samyang Ranch is home to herds of cows and sheep, which graze across the extensive grasslands; the stretch of towering wind turbines on the top of the hill creates a fantastic landscape, making it a must-go destination. In spring, the pasture blooms with wildflowers, and cool breezes blow away the summer heat. The mountains display their majesty with autumn foliage while white snow blankets the fields in winter. No matter the season, Samyang Ranch is always a sight to behold. From the entry plaza to the observation point is a stretch of about 4.5 kilometers. When the skies are clear, visitors can see as far as the East Sea. As it is located on the highlands, the vast temperature difference makes it much colder at the peak, so preparing long-sleeved clothing is recommended, even during summer. Often described as the "Alps of Korea," Daegwallyeong Sheep Farm is where visitors can appreciate and enjoy the picturesque landscape of wide grass fields along with the eastern coast against the clear blue skies. During spring, summer and autumn, herds of white sheep roam on the spacious green plains. 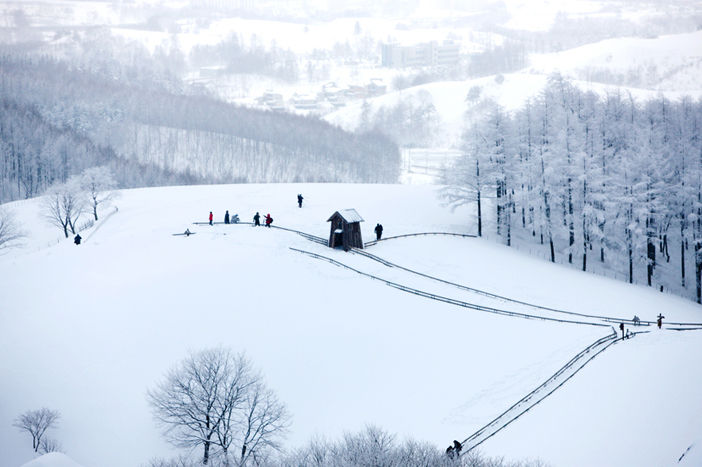 Daegwallyeong Sheep Farm is most famous in winter as it is especially known amongst photographers for the perfect amount of snow which covers the fields like a blanket. An approximately 1.2 meter-long walking trail surrounds the sheep’s grazing field. Visitors can view the sheep and take pictures from all angles as they stroll along the path. Jeonggangwon was established in order to preserve, research, distribute and promote the values and merits of traditional Korean food culture to the world. 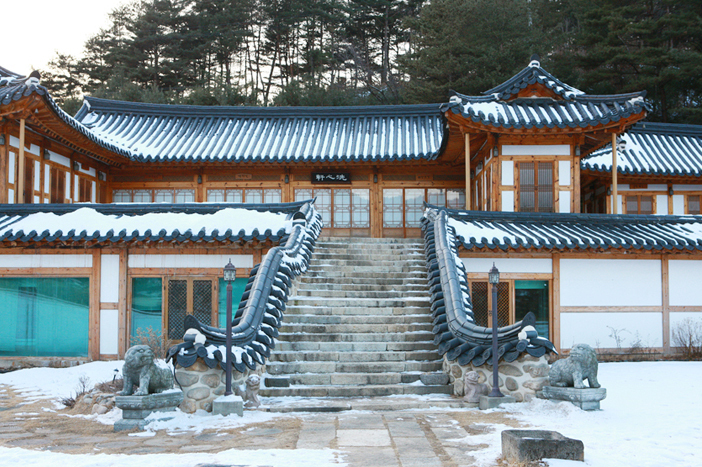 The hanok-style buildings of Jeonggangwon include a food museum, as well as a hanbok experience and cooking lessons. A restaurant that offers traditional hanjeongsik (Korean table d’hôte) is also available. The beautiful hanok buildings, garden, and hundreds of jangdok (traditional Korean crock) gathered together are especially popular among international visitors. 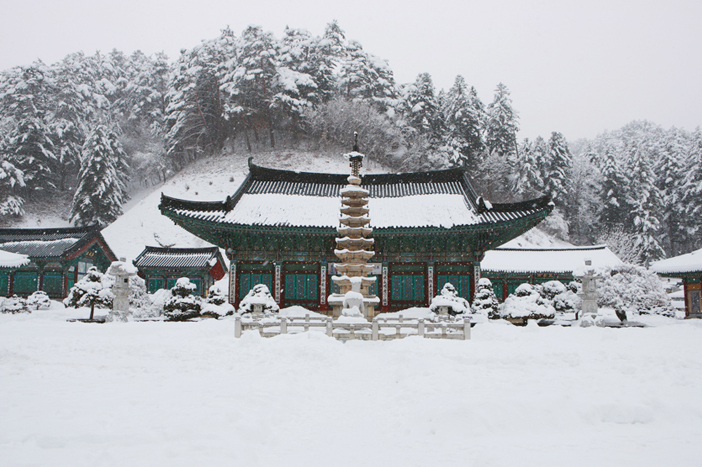 Woljeongsa Temple boasts a history of over one thousand years, making it a proud cultural site in Pyeongchang. 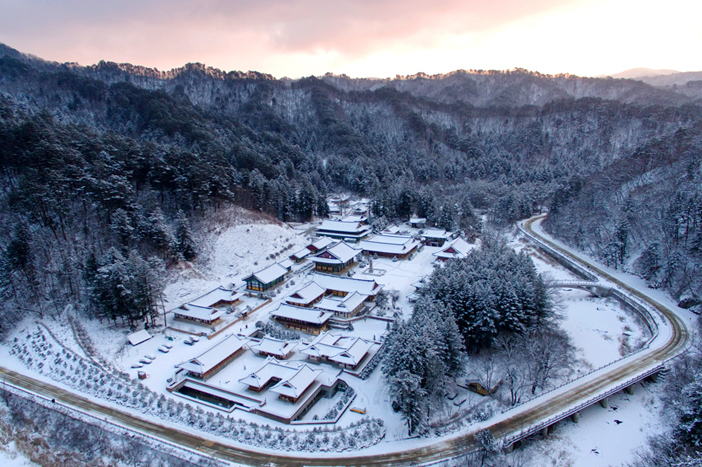 Although many cultural assets were destroyed during the Korean War and then later reconstructed, visitors can still sense the strong coexistence of Odaesan Mountain’s nature with Woljeongsa Temple’s dignity and spirit. Woljeongsa Temple has many national treasures, including an octagonal nine-story stone pagoda. Other national treasures that have been excavated are preserved in Woljeongsa Museum, a definite must if you are visiting the temple. From the entrance of Woljeongsa Temple, a separate road leads off to a path through a dense fir tree forest. Not only magnificent in appearance, walking through this pathway filled with fir trees can be equally relaxing and refreshing to one’s mind, making it a popular destination among the locals. * This column was last updated in February 2019, and therefore information may differ from what is presented here. We advise you to check details before visiting.